You can now watch this week’s Nintendo Minute episode, in which Nintendo of America’s Kit Ellis and Krysta Yang play Luigi’s Mansion on Nintendo 3DS. 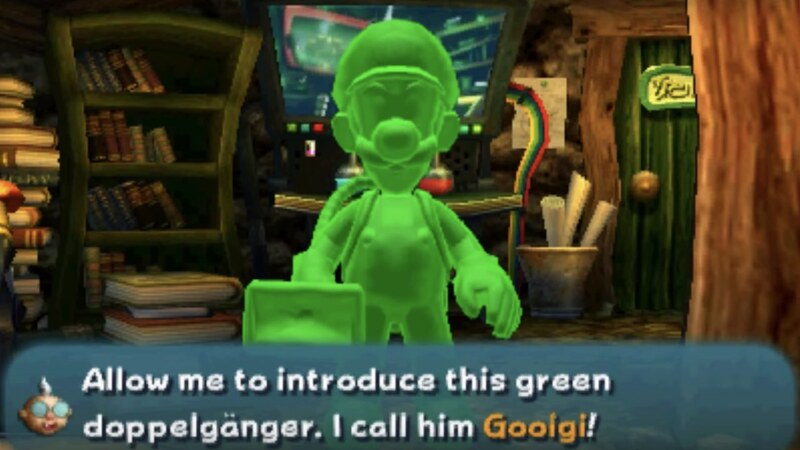 That specifically sees them team up in the new Co-op mode, where, when Professor E. Gadd unexpectedly receives a call from himself in the future, you are introduced to a “green doppelgänger” that he calls Gooigi. Future Professor E. Gadd has created Gooigi in Luigi’s likeness, and, while he’s just as skilled with the Poltergust, he can burn and melt easily. Although, even if he is defeated he can be revived as many times as needed. Gooigi still needs more testing, which is why the gooey creation has been sent to the past. If two players borth own Luigi’s Mansion on Nintendo 3DS, they can explore the mansion and capture ghosts together in the main story or battle against Portrait Ghosts in Portrait Battle. Or, if you only own one copy, you can use Download Play to try out Ghost Training or Portrait Battles together. Luigi’s Mansion will is now available exclusively for Nintendo 3DS in North America and releases in Europe on October 19th.